The ALIENGT solar fountain helps you to attract birds who enjoys the water movement in the bird bath fountain where they can have a bath, cool themselves and getting a drink from it in hot summer. The solar fountain pump is a must buy to decorate your garden, patio, yard, backyard, fish tank, small pond, pool, etc. 1. Remove the film which covers the solar panel. 2. Make sure there is no leaf or anything else shade a part of solar panel. 3. Ensure the pump under the enough sunshine, suggested in the midday sunshine. 4. Pull out of the plug, the head part first, and make the pump work for seconds to let the air go out of the pump. The pump may work intermittently or stop from running under the following situations. 1. cloudy or overcast . 2. It is partly covered by a shadow of a tree branch. 3.There is leaves on the panel surface. 4.The intake filter is clogged by debris/dirt. 5.The water level is too low for the pump to remain working. If your birdbath is too small ,and you don't want to refill the water often. --Anchor it in the centre of birdbath to keep it from floating to the edge and emptying all the water. --If your birdbaths are made of glass or metal, use the three suction cups on the bottom of the fountain. ✪ ECO-FRIENDLY & LONG LIFE: ALIENGT solar fountain pump has high-efficiency solar panels and has excellent solar power collection, making it an energy-saving and environment friendly choice,ALIENGT solar water fountain pump has a built-in brushless motor that provides a longer service life and lower energy consumption, it has more than 50,000 hours of service life. 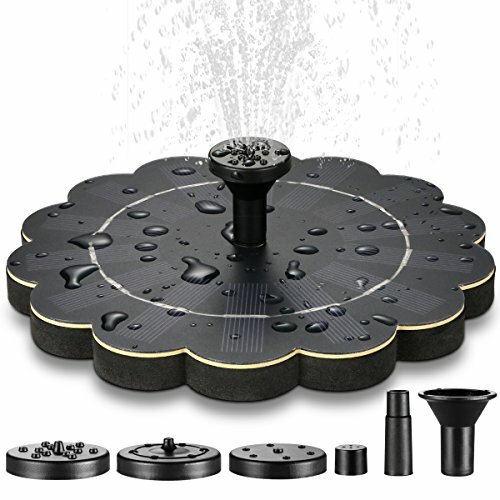 ✪ FULL MONEY BACK GUARANTEE: Our Unique flower Shape design floating solar fountain is absolute the perfect family gift.Get it, try it soon! If you don't like it, NO WORRIES, we provide a 30 days full money back guarantee and 12 months replacement service ! We promised that you will enjoy professional after-sale service. If you have any questions about this product by Aliengt, contact us by completing and submitting the form below. If you are looking for a specif part number, please include it with your message.